What to know: The Bannister family - including former K-9 police hero Zeus (voiced by Mario Lopez) - is back, and this time they're spending their holidays at a beautiful Rocky Mountain resort. I liked Zeus, because he was funny. He had a funny voice. I think my favorite character was the black dog, Trooper. He was cool because he was a police dog and he lived in the Colorado Rockies! Trooper also saved Zeus and his poodle girlfriend. The bad guys were very funny. 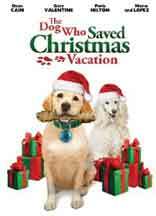 This is a good movie for Christmas and for people who like dogs. The Bannister family takes off for the Colorado Rockies to spend Christmas together, but are surprised to find that a family member is already staying at mom's cabin. Throw in a couple of silly bad guys, and nothing happens the way they expect it to. A family friendly film that embraces the spirit of the holidays. The Bannister family is a great example of how we should treat each other. They don't talk at all about what toys they will get, only about spending quality time together. That is a great way to present the season to young children. Some rude behavior and excessive flatulence makes this less appropriate for young children. Children will love the "talking" dogs and dog tricks the canine actors perform in their roles. Good acting and scenery. The Bannister family - including former K-9 police hero Zeus (voiced by Mario Lopez) - is back, and this time they're spending their holidays at a beautiful Rocky Mountain resort. But toss in an unexpected visit from cocky Uncle Randy (Casper Van Dien of "Watch Over Me" and The Curse of King Tut's Tomb) and his foxy poodle Bella (voiced by Paris Hilton) and a familiar pair of bumbling jewel thieves (led by Dean Cain of "Lois & Clark: The New Adventure of Superman" and The Dog Who Saved Christmas) and this holiday may be headed downhill fast! Can Zeus solve the crime, save Bella and hit the slopes, all in time for Christmas Day? Gary Valentine ("King of Queens") and Elisa Donovan ("Sabrina the Teenage Witch" and Clueless) co-star in the all-new four-legged family adventure!